In my bookmarks window I have two to three folders like asp.net, jquery and sql server. How do I export the jquery folder only from Google Chrome? The Data Liberation Front has a short statement about this: It seems to be possible to export the bookmarks to Google Docs. Perhaps post-processing is easier there. However, I haven't tried that. Create a new user in Chrome, then drag your desired bookmarks to the bookmarks of the new user (make sure you enabled bookmarks bars being shown for two users). Next, export bookmarks from the new user. Voilà! It doesn't seem possible by now. You can export all of your bookmarks then edit with a text editor and delete unwanted. If you temporarily seperate your bookmarks into groups before it's easier to do. Move the folder you want to export to the left end of the bookmark bar. Export all bookmarks to file. Open the file in notepad. Find the bookmark that appears last in the folder you are trying to export. Delete everything after that bookmark. Save the file. Edit (18-07-01): updated so it works in chrome's latest bookmarks (chrome v67). You can use this JS folder-exporter I hacked together. Note: this may break any time Chrome changes the underlying HTML of their bookmarks manager. Or put this bookmarklet to your bookmarks-bar and click it any time you're in your folder you want to export (it's the same code as above, including the save-as-file). You can style the output as you wish in the ret.forEach loop. click once on the first listing, so as to select it. ctrl-A to select all in the right side window, ctrl-C to copy all of the contents. Paste (ctr-v) links into text document. Save as rich text. If you would prefer in word, copy from text editor and paste in word. *This method provides the title of the pages you saved, with the URL link in it. If you ONLY want the URL, instead of opening a text editor at step 4, open a WORD doc. Paste (ctrl-v) there and you will only have a list of URLs. Delete all the folders you don't want to Export. Now, Export. It will only export the one folder left. Once done, Ctrl+z on bookmarks manager, and you'll get back all the deleted bookmark groups back. Export all bookmarks into a file. This answer is similar to "delete folders, export and restore with ctrl-z", but is more secure and loss-free. I found no way but to export Bookmarks into .html file and then open it (using chrome). Then I have to hand-pick all required bookmarks and copy them. In the "Bookmarks bar" create a new sub-folder, say "Export", and position it as the 1st (top-most) sub-folder in the "Bookmarks bar" . When you export Bookmarks - this subfolder will be the 1st (the top-most) in the exported file. Withing Bookmark Manager copy required items into the "Export" one. Export all bookmarks to html document. Edit the file (using notepad++ or any other html editor) and delete all unwanted parts. Save it and import it again. Switch to new chrome user, then drag and drop bookmark folder to new user bookmark. After done, export it from new chrome user. 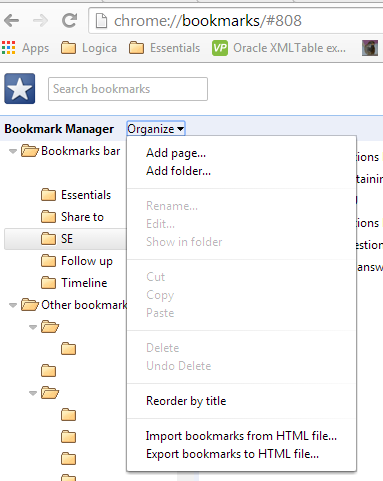 Select "Bookmarks Manager", then select "Organize". Select "Export bookmarks to HTML file...". Name your file and save on desktop. The file saved will have ALL bookmarks. Open this file, highlight only the bookmarks you want, and copy and paste on a MS Word document BUT save this document as an HTML file. Make sure you remove "docx", and change the extension to "html" after the file name. Make sure, under "Save as type:" you select "Web page (.htm;.html)". Now you have an html file with only the bookmarks you want. You can now email this anywhere, and import the bookmarks from this file into the browser by selecting "Import bookmarks from HTML file..." under "Organize". I don't think you can get any simpler. Import the original file to restore everything Simple, elegant and hassle free. To save your Chrome bookmarks as a .doc file or .pdf file: In Chrome Export your bookmarks as an HTML file. In Firefox, open that HTML file that you just saved. CTRL 'A' to select all then open WORD In a new document CTRL 'V' to paste. At the bottom of the text that you have just pasted is a small box with a clipboard inside and the word (CTRL). Click on the small downward pointing chevron and then select "Keep source formatting (K) Now save as a Word document or a PDF. There are more efficient ways, better ways and so on and so on... but I think in this case the easiest way is just sufficient. No Text Editing. Not the answer you're looking for? Browse other questions tagged google-chrome bookmarks or ask your own question. How to export my bookmarks via CLI in Google Chrome? Is there a way to hide single bookmarks or bookmark folders in Google Chrome (or Chromium)? How do I share an individual Google Chrome Bookmarks folder with someone else? How can I export bookmarks in Google Chrome? How to Manage Chrome Other Bookmark Folders?